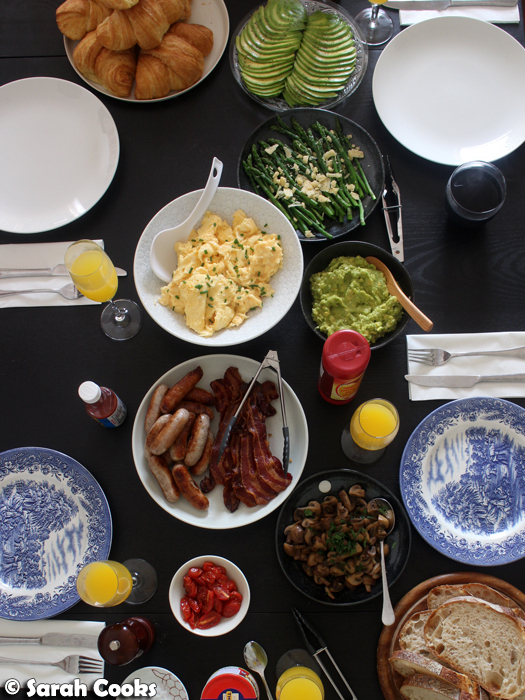 Who doesn't love brunch? 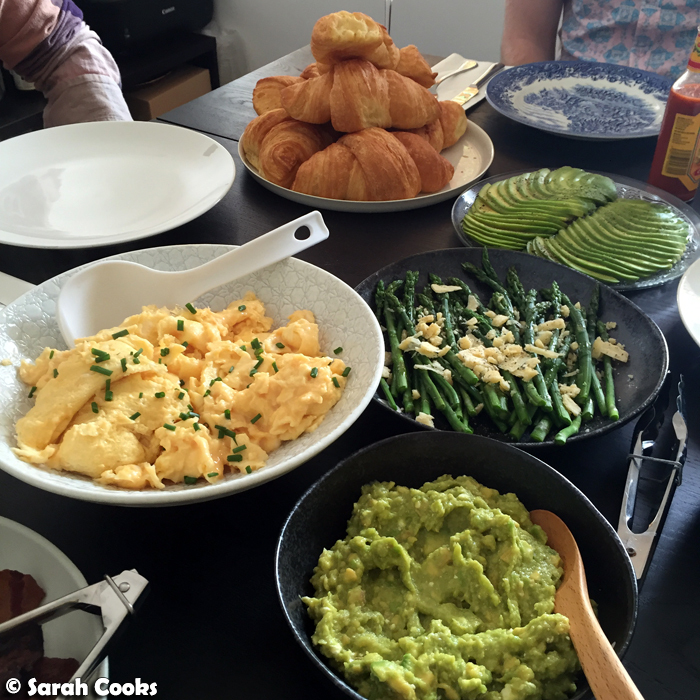 A few weeks ago we had some friends over for brunch and it was so much fun! The idea of hosting a brunch party came about because I wanted an excuse to make those cinnamon rolls again (and not eat the whole tray to myself). 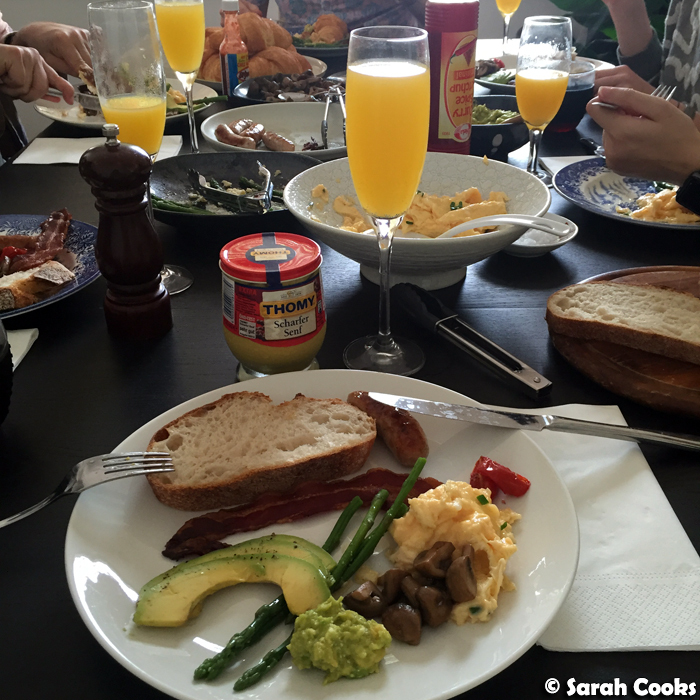 I also loved the idea of mimosas - a sneaky bit of daytime drinking! 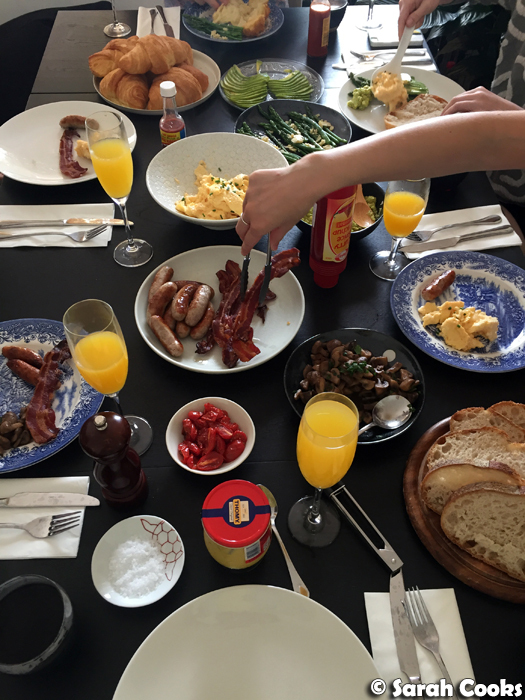 We quickly sent out some invitations, planned the rest of the menu, and brunch was born. So, I know we went a little OTT with the menu! 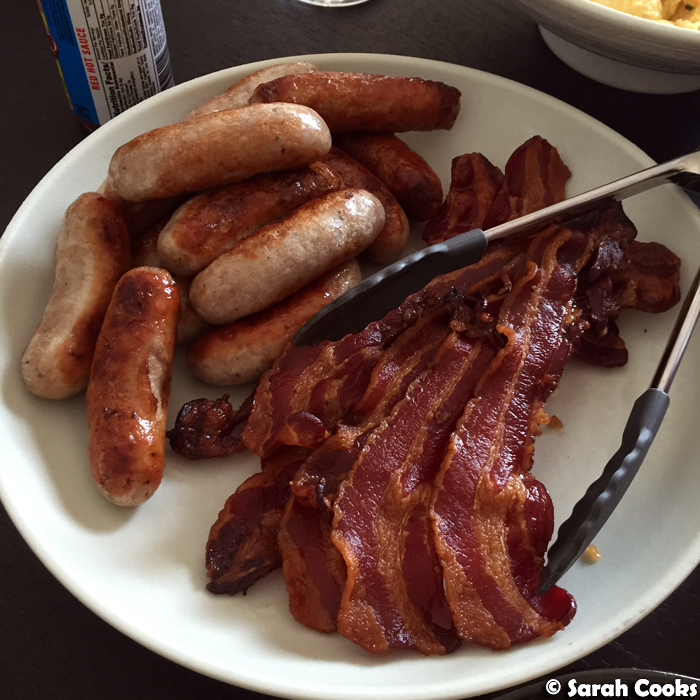 For the savouries, I basically tried to think of things that would go on a big breakfast (bacon, sausage, eggs, mushrooms, bread...). Sandra made the wise suggestion of adding some greens (asparagus), and we tried to use up some things we had in the fridge (cherry tomatoes, avocado). I know it's a bit extravagant doing avocado two ways - but as you know I've got that 12-avocado-a-month subscription, so the faster I can eat them the better! 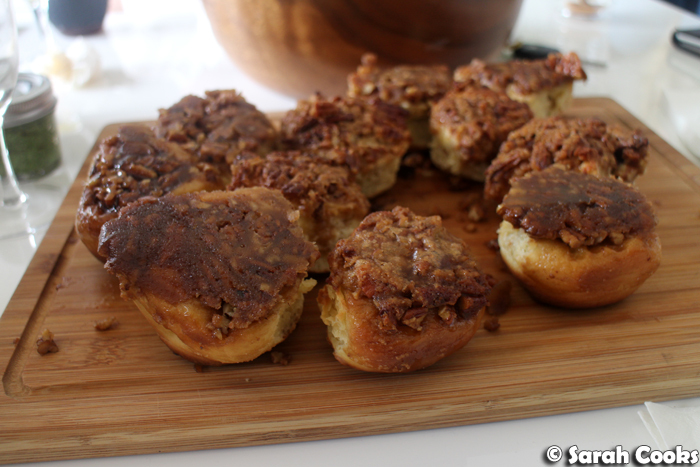 Of course there were the cinnamon rolls for dessert too! 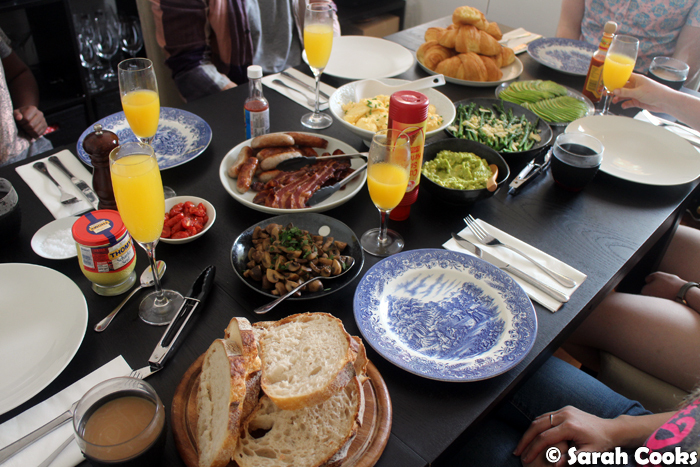 For drinks, we did a big pot of filter coffee, (delicious, and much easier than making lattes to order), and the aforementioned mimosas. (That's equal parts chilled sparkling wine and orange juice). 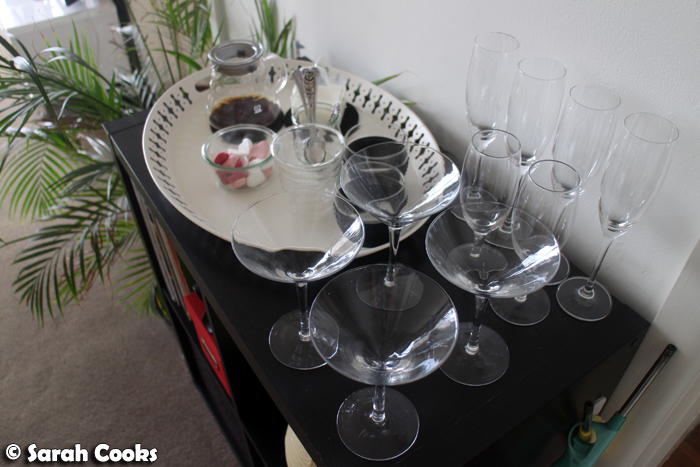 We made a little drinks station in the lounge room so that people could help themselves. But it also made us look like Serious Grown-Ups who throw fabulous parties regularly. The martini glasses were there just in case anyone wanted espresso martinis (super easy to make, here's the recipe), but... ahem... most people were driving and less enthused about daytime drinking than I was, hehe, so we didn't end up making any. It got quite busy in the kitchen! The cinnamon rolls had been made the night before and baked off in the morning, and following that it took two of us about an hour to put everything else together. No individual element was difficult; it was more a matter of being organised and co-ordinating everything. 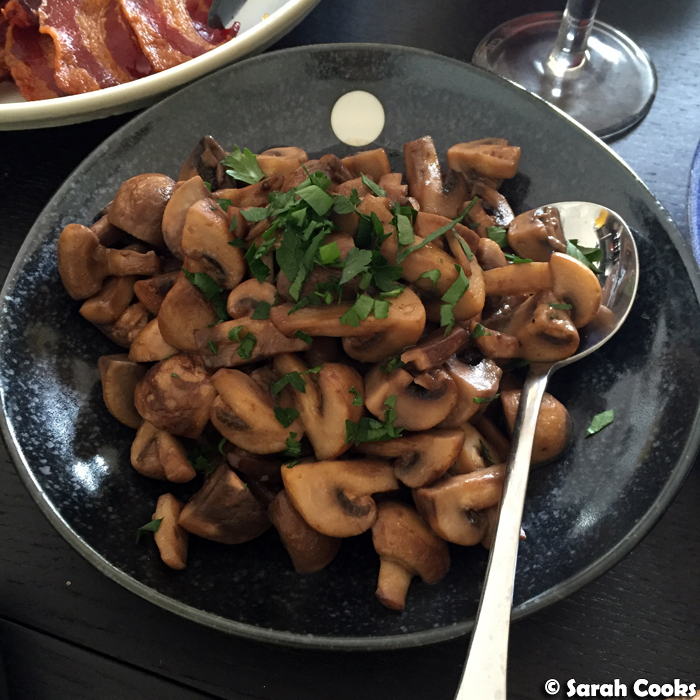 The mushrooms were cooked in a little butter and garlic, and seasoned generously with salt and pepper. They were finished off with a squeeze of lemon and some parsley. Meat! 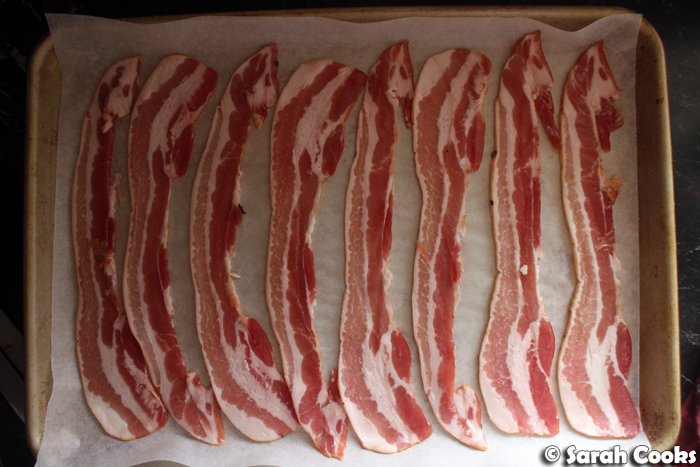 I know I say it every time, but Peter Bouchier's dry cured streaky bacon is The Best. And no, they don't give me free bacon (I wish! ), they're just my favourite bacon! This time, we also bought Peter Bouchier's pork chipolatas, which were also fabulous. English Andy and German Sandra both heartily approved. This was a really fun way to catch up with a group. After much languorous picking at all the savouries, we moved to the lounge room to keep chatting and start on the cinnamon rolls. I was super impressed that our group of six managed to finish almost all of that food, and still find room for a cinnamon roll or two. Good job, everybody! 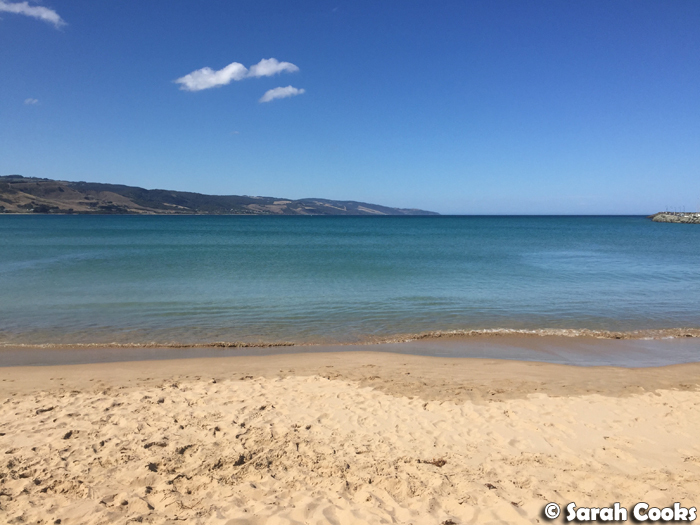 Earlier this month we spent a fabulous weekend in Apollo Bay. It was a super chill weekend, just lots of relaxing, some beach time, and lots of good food! 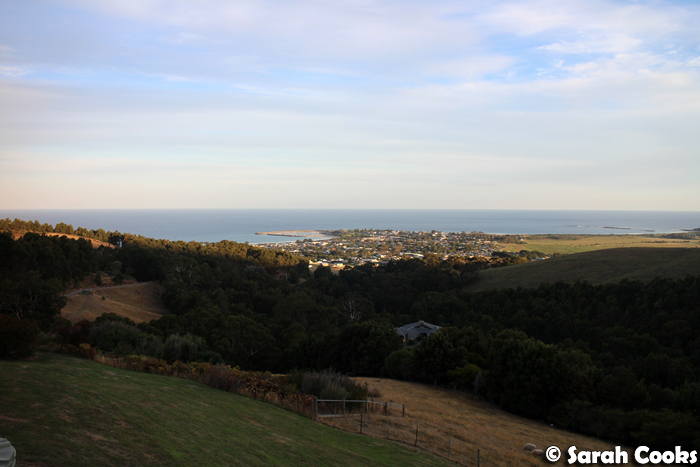 We stayed at a cute villa overlooking Apollo Bay; Point of View. I was recommended this place by a colleague and it was really nice - the villa had a gas fireplace, Weber BBQ, a huge jacuzzi, double shower, Foxtel and more! 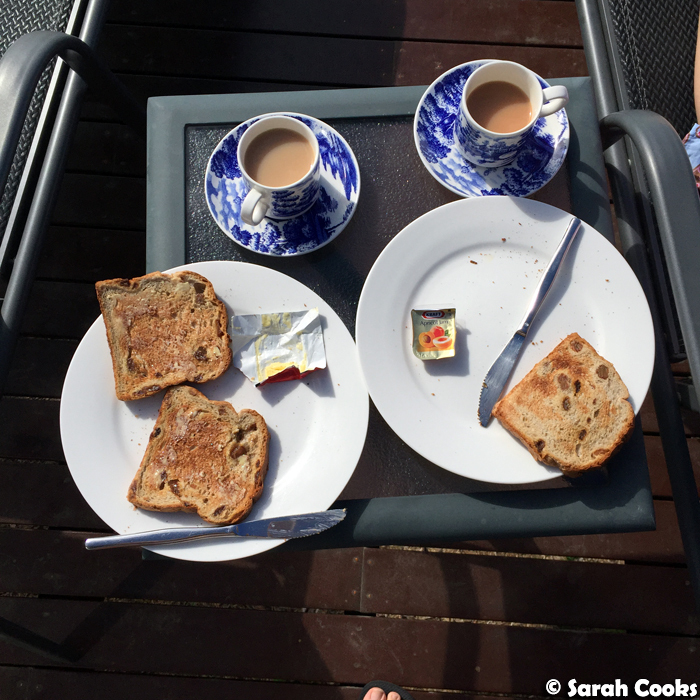 The only (potential) negatives were that the breakfast provisions were a little basic and that there was no wifi - but these weren't dealbreakers for us. 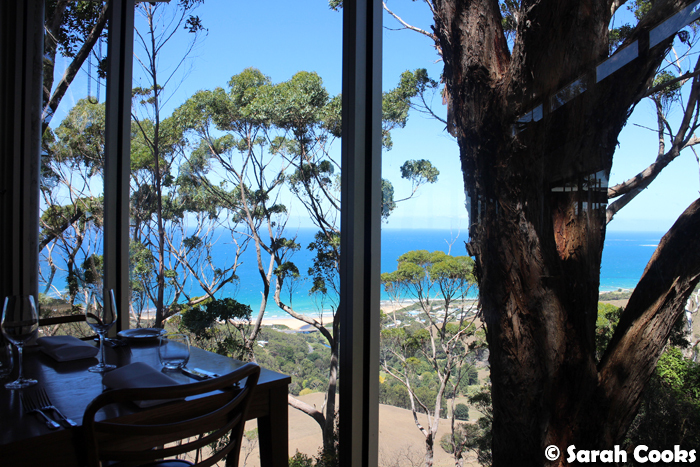 The owners were really friendly, and the villa had absolutely gorgeous views across Apollo Bay, Bass Strait and the surrounding farmland! 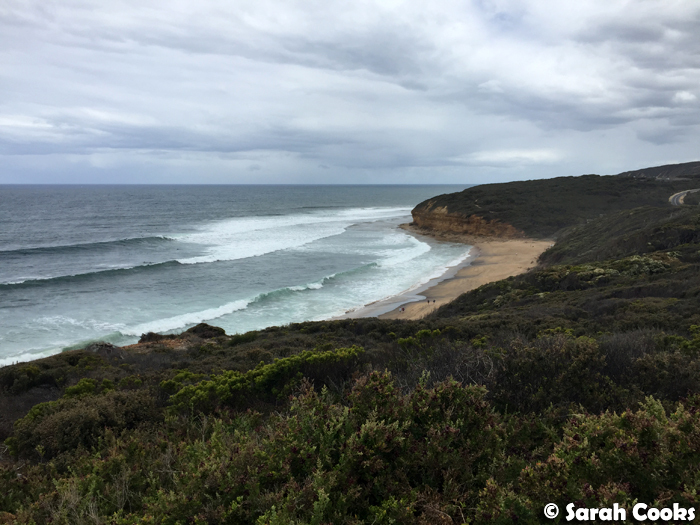 We drove across from Melbourne on a Friday after work, and after the long drive down the Great Ocean Road I didn't fancy driving back out for dinner, (especially up and down the unlit winding dirt road that led to the cabin! 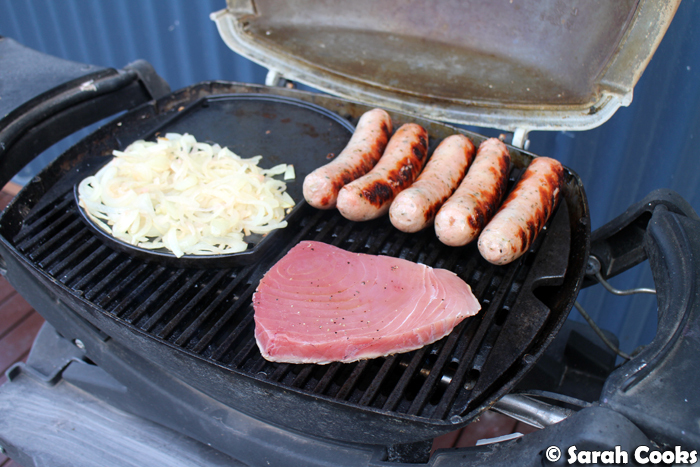 ), so it was lucky that we'd decided to bring some supplies for our first night's dinner! 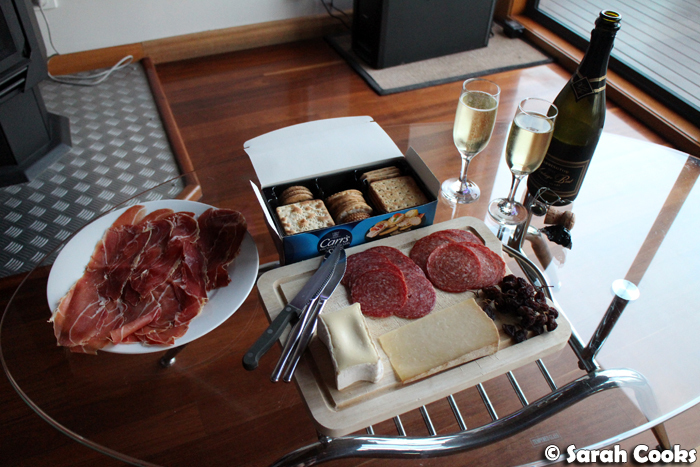 We made a little cheese and charcuterie platter, with Buche d'Affinois, Cabot cheddar, jamon, salami, muscatels and crackers! 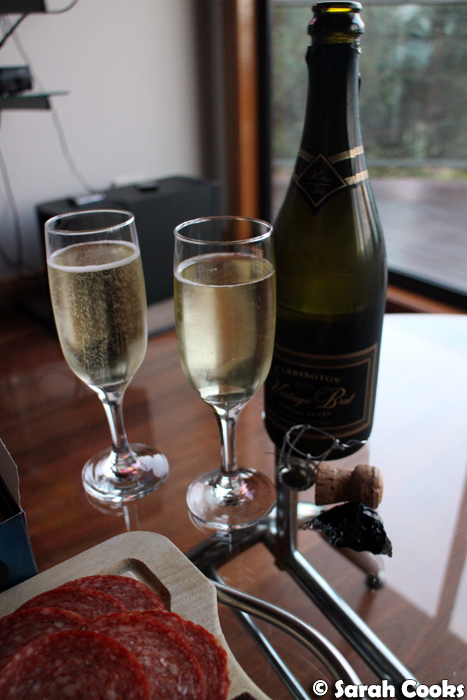 With the bottle of sparkling wine that was included in our room it was a very civilised way to end the week! ... because we had a lunch reservation at Chris's! 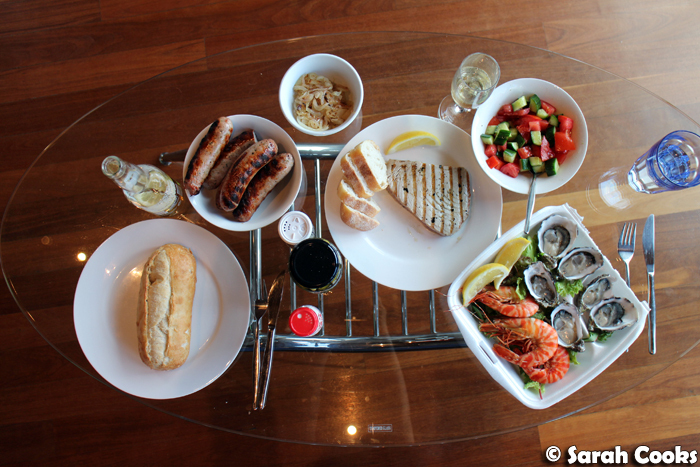 Chris's is a long standing, well-known and popular restaurant in Apollo Bay, with a focus on fresh seafood with Mediterranean flavours. 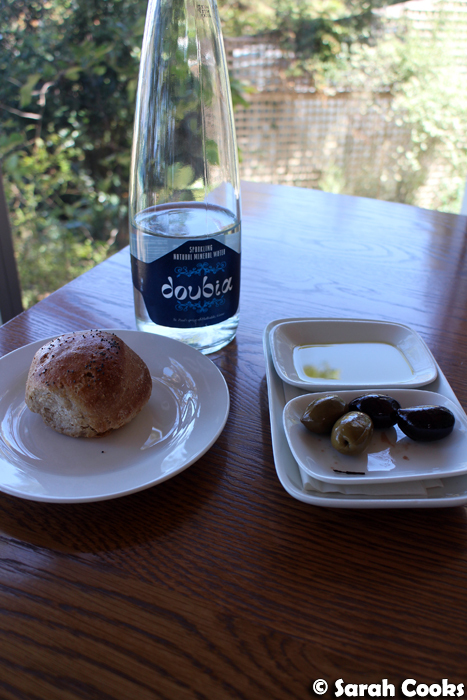 Due to the fact that I was driving, and also because it was lunch time, we decided, sadly, to decline the offer of complimentary ouzo, but the house-baked bread rolls and olives were still a nice way to start the meal. 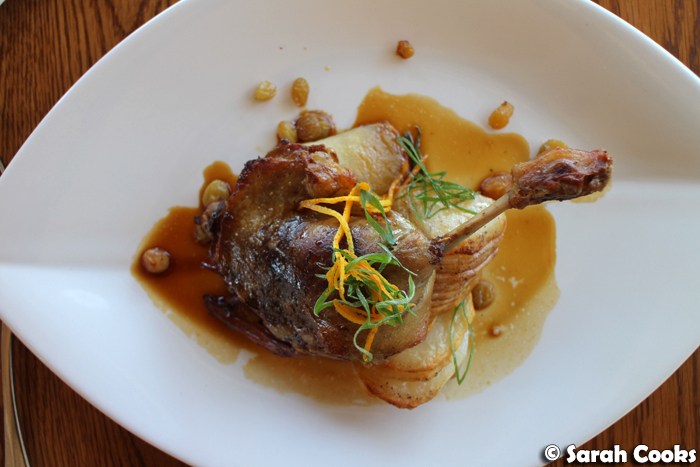 Also impressive was the confit duck leg with buttery Lyonnaise potatoes, caramelised apples and golden raisins. The meat was very tender and fell of the bone. Lovely! 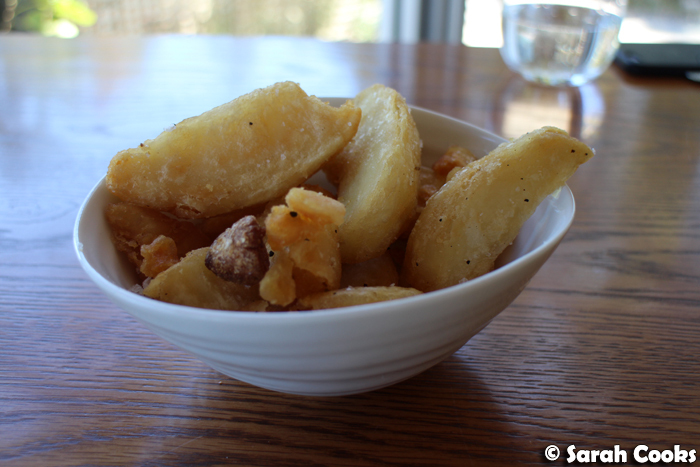 The highlight, for me, was the ridiculously delicious fat chips. These chips were incredibly crisp (I'm sure they were at least double fried), and super fluffy on the inside. They were fried with garlic and had some other spices in the mix. Absolutely wonderful! We were too full for dessert, so headed straight to the beach for an afternoon of relaxing! 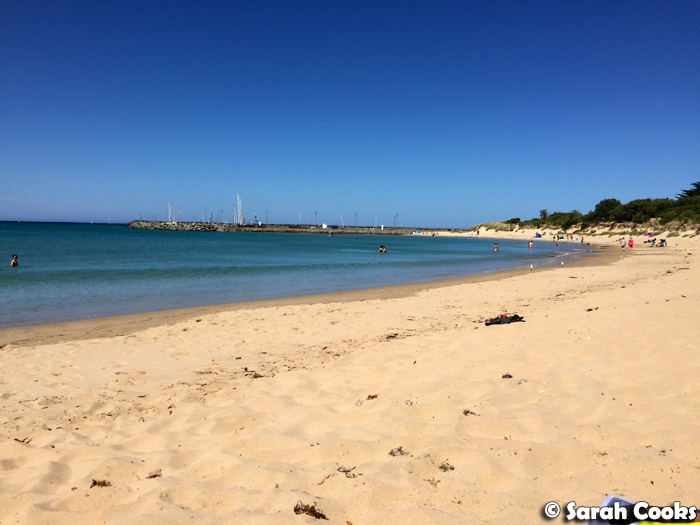 Apollo Bay beach is gorgeous! 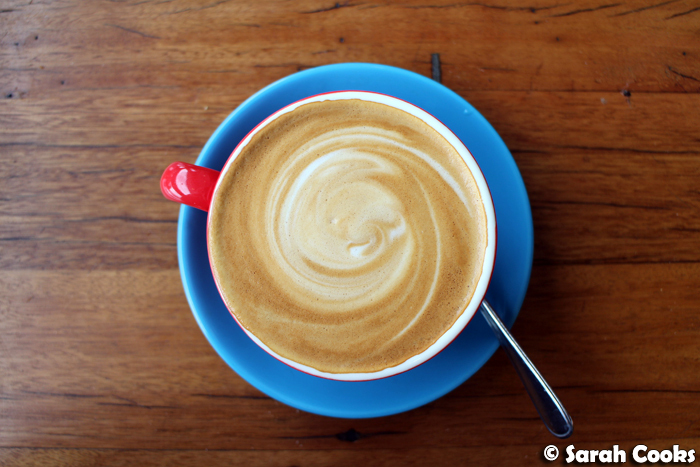 After the beach, we got some great iced coffees at Sandy Feet Cafe (139 Great Ocean Rd, Apollo Bay VIC 3233), a cute health food cafe with a little grocery store, and then went to get supplies for a barbecue dinner! 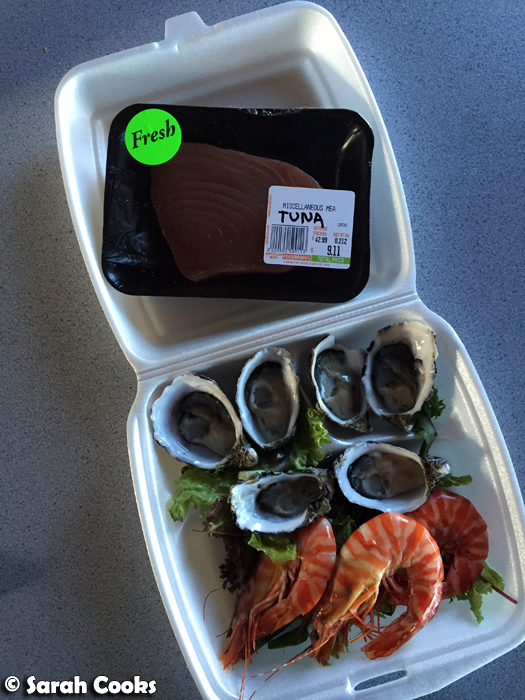 We got most of our food from the Apollo Bay Foodworks supermarket (they have a surprisingly good selection of fresh seafood - I got a gorgeous tuna steak there! 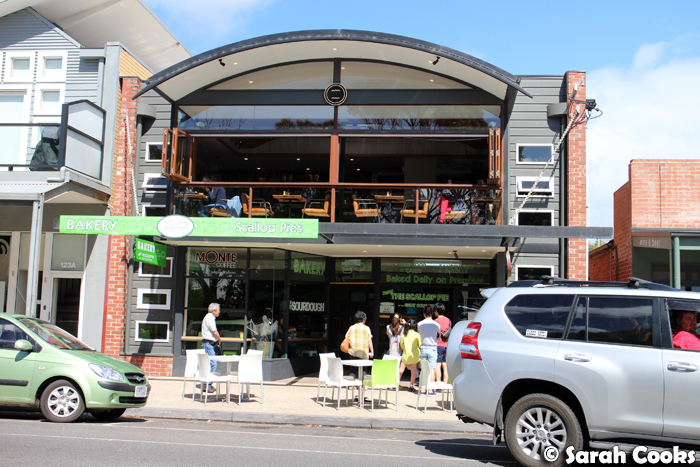 ), and the local fish and chips store, where I splashed out on half a dozen fresh oysters and three gigantic prawns. Woohoo! The next morning, we decided to check out a cafe in town for breakfast - pre-trip Googling led us to La Bimba. 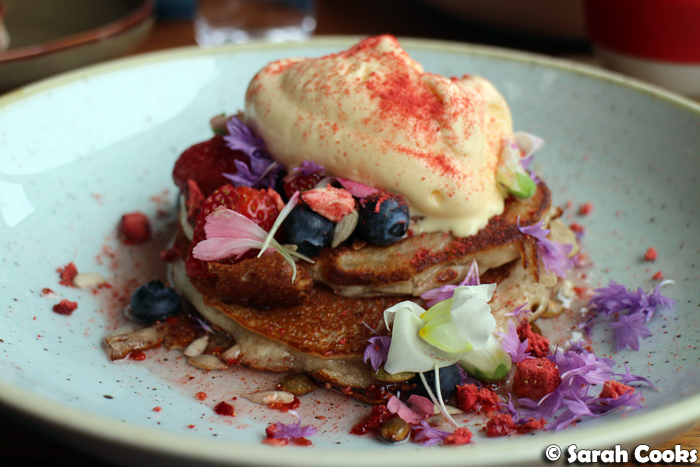 Three housemade hotcakes (definitely housemade because they were all irregularly shaped), were served in a stack and decorated very prettily with toasted pumpkin and sunflower seeds, fresh and freeze dried berries, flowers, and syrup. I was particularly impressed with the vanilla ice-cream. I'm not sure if it was made in-house or a high quality purchased ice-cream, but it was rich and creamy and a lovely golden colour, which leads me to believe it was made the traditional way, with a base of egg yolks. So good! And then it was time for the long drive home. We made a little stop at the famous Bells Beach to stretch our legs. And even more exciting was the lunch we had at the Hungry Jack's in the Little River truck stop on the way back into Melbourne. It happened to be Valentine's Day as well - super romantic! 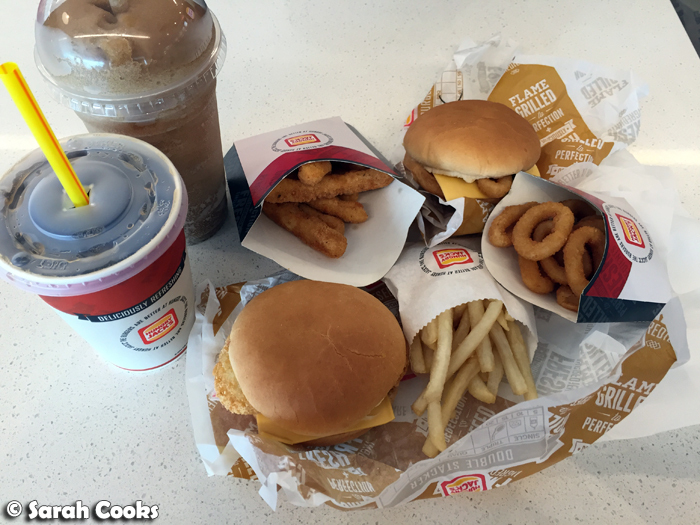 PS - those Hungry Jack's chicken fries are actually really yum! 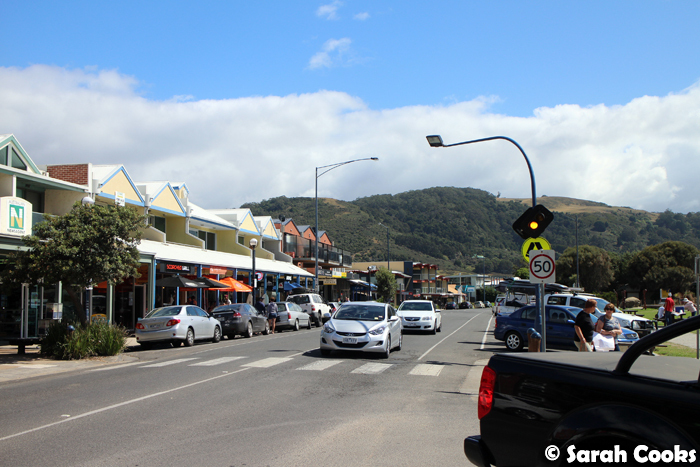 And that was our weekend in Apollo Bay! 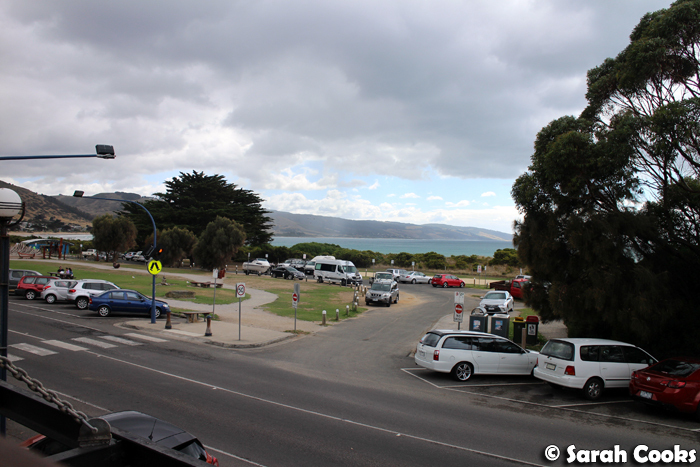 Do you have any favourite spots along the Great Ocean Road? 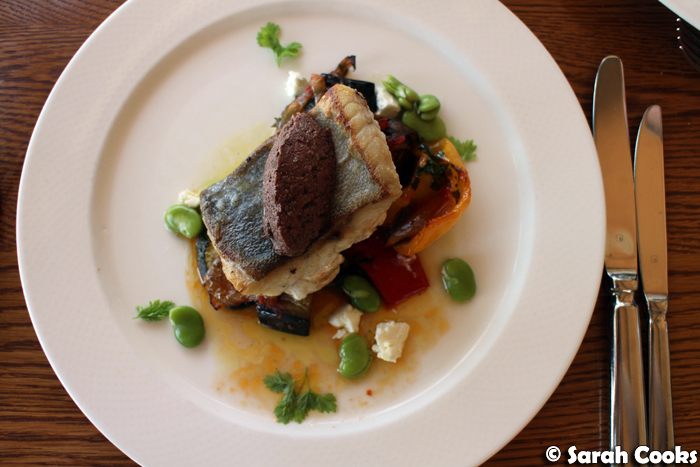 Do you ever order the same dish as your dining companions when eating out? And do you love dirty truck stop junk food meals as much as I do? (Hint: I love them a lot). 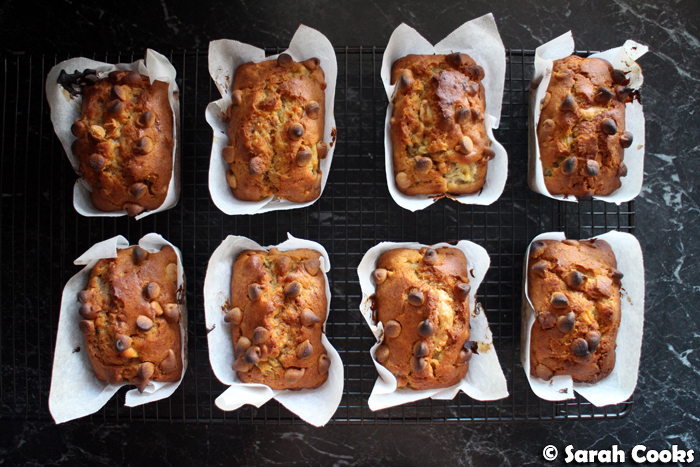 My fallback banana bread recipe is Bill Granger's (full of choc chips - delicious! ), but this time I wanted to try something different. The answer was peanut butter. And incidentally, my local supermarket has started stocking Reese's peanut butter chips now! Woo-hoo! ... and a secret peanut butter centre! Zomg! 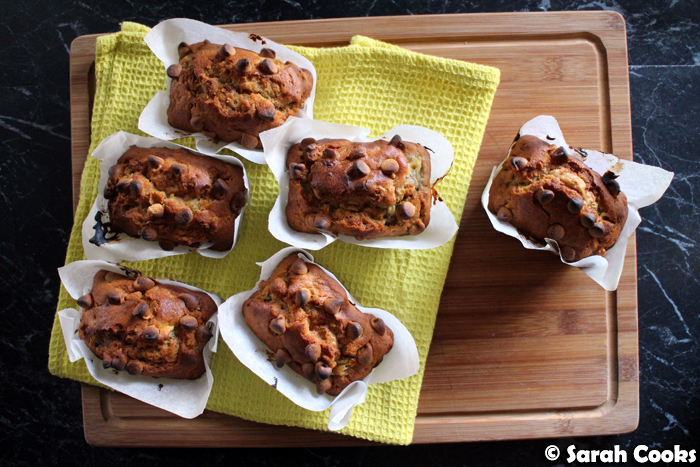 I made these in mini loaves, because I just adore my mini loaf tray, but of course you could make these as regular muffins if you don't have a loaf tray. I ate these for breakfast and afternoon tea, and shared them with coworkers because I'm super generous. (And also I knew I'd eat them all if given the chance.) 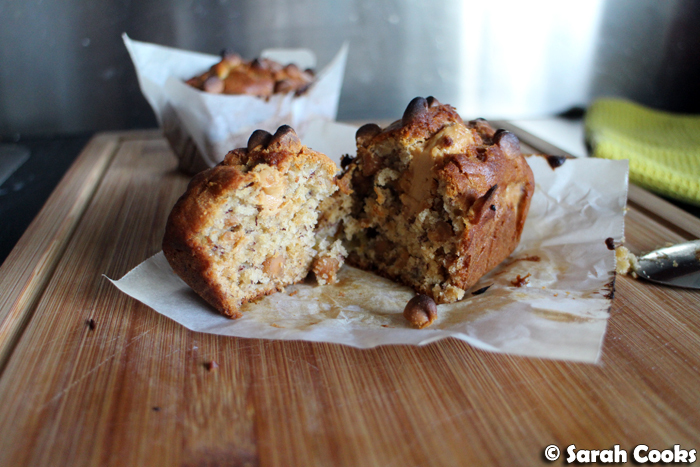 These were moist and tender and incredibly peanut buttery - perfect with a cup of coffee for an absolute treat of a breakfast! Enjoy. 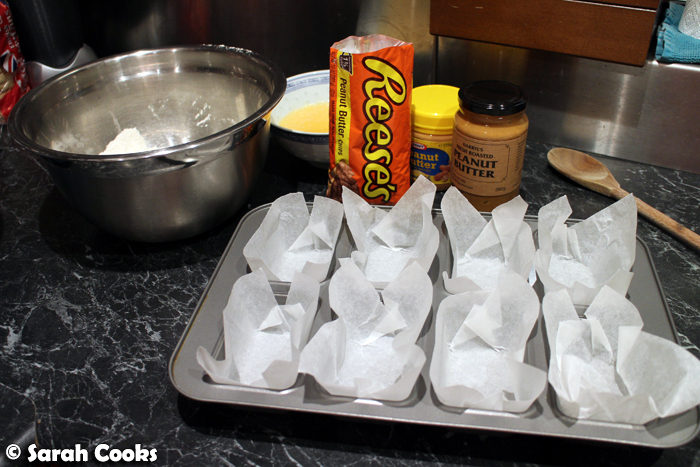 Preheat the oven to 180C and line an 8-loaf mini loaf tray with baking paper. Mash the bananas and set aside. Place the oil and eggs in a small bowl or jug and whisk together. Place the flour, sugar, bicarb and baking powder into a large bowl and whisk together to combine. Mix in the egg-and-oil mixture, followed by the mashed bananas. Finally, stir in the peanut butter chips. 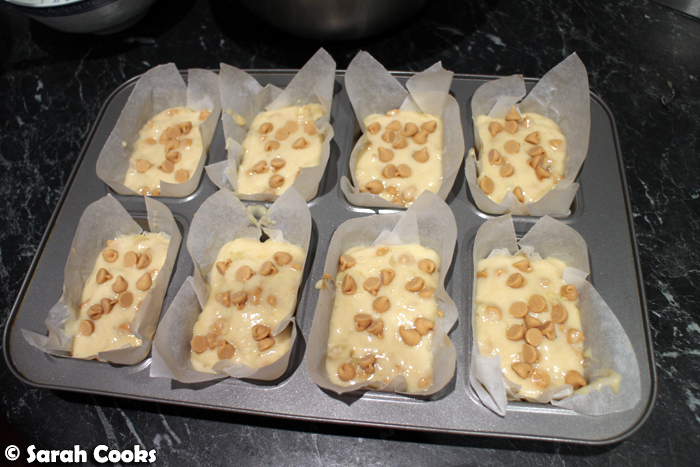 Half fill the indentations in the loaf tray with the mixture. 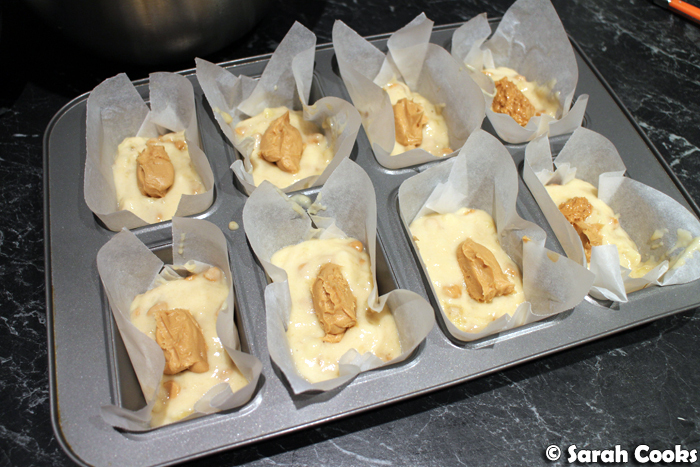 Spoon a teaspoon of peanut butter into each mini-loaf, then top with the remaining mixture. 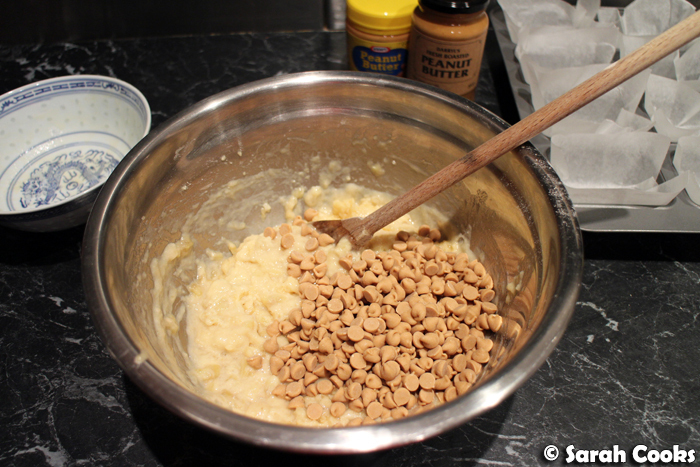 Sprinkle with extra peanut butter chips. Bake for 20-30 minutes, or until golden brown and cooked through when texted with a skewer. Hi everybody! Gong Xi Fa Chai! Keong Hee Huat Chye! 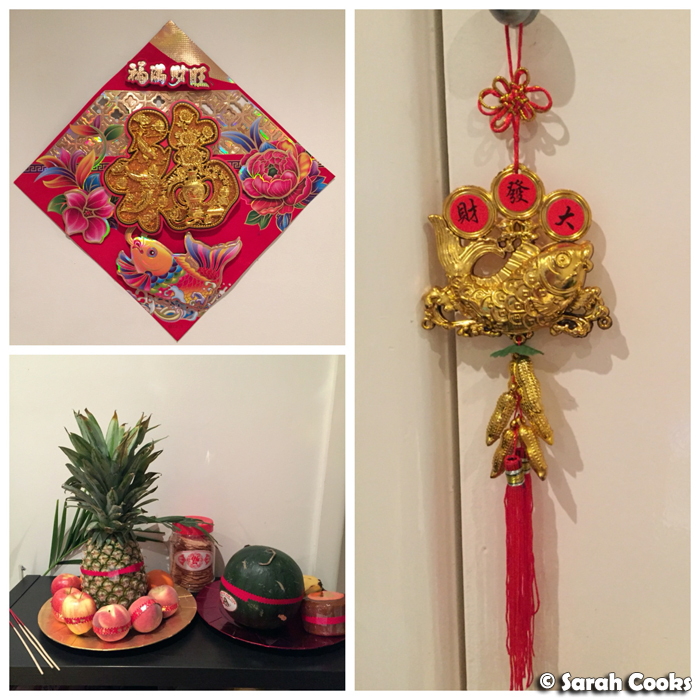 Happy happy Chinese New Year! 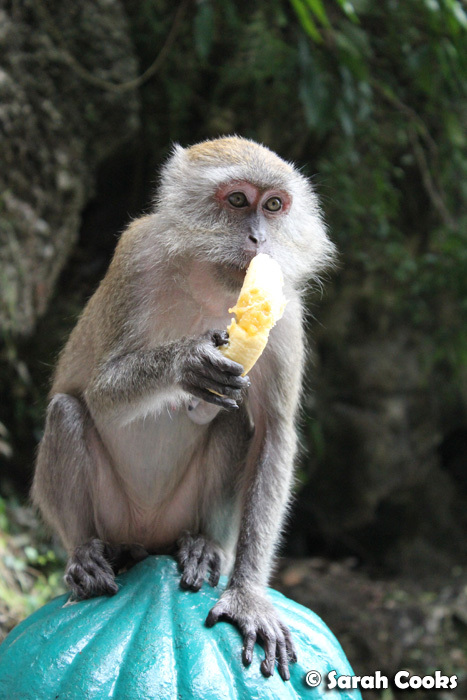 I hope the year of the Monkey is a fabulous and lucky year for you, with lots of fun times and good food! Just like this guy. And on Sunday evening, we had our family reunion dinner at my parents' house. 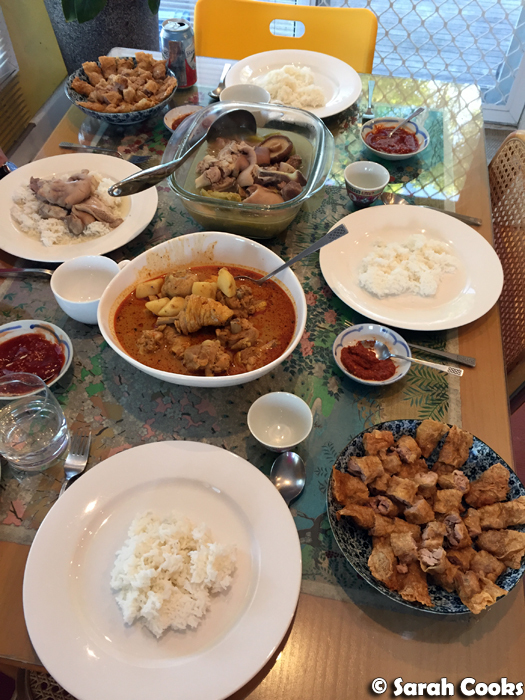 They cooked all of our favourite New Year's food - loh bak (spiced chopped belly pork wrapped in beancurd skin and deep fried), curry chicken kapitan, and kiam chye th'ng (duck, pork, and mustard green soup). Yum! 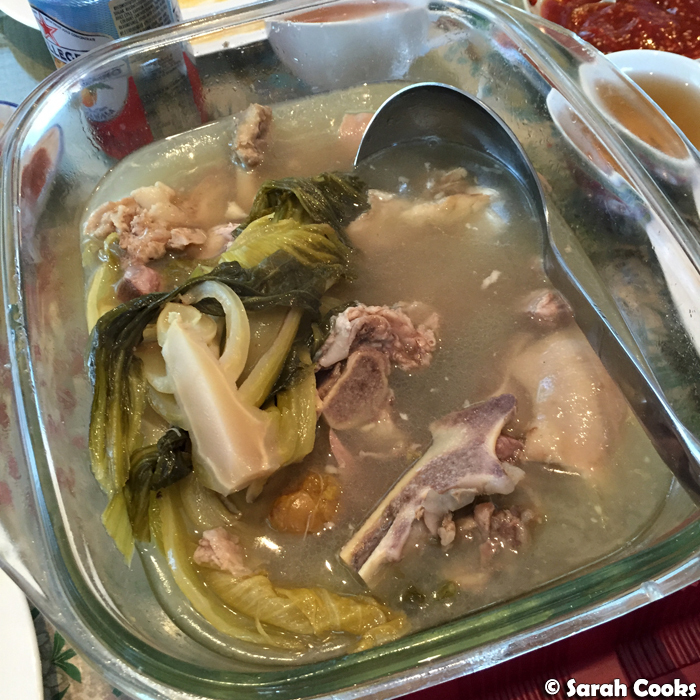 These dishes are traditional in Penang during the New Year's period - there are lots of other traditional dishes too, but these three are the ones that my family loves and eats every year. I love them so much! 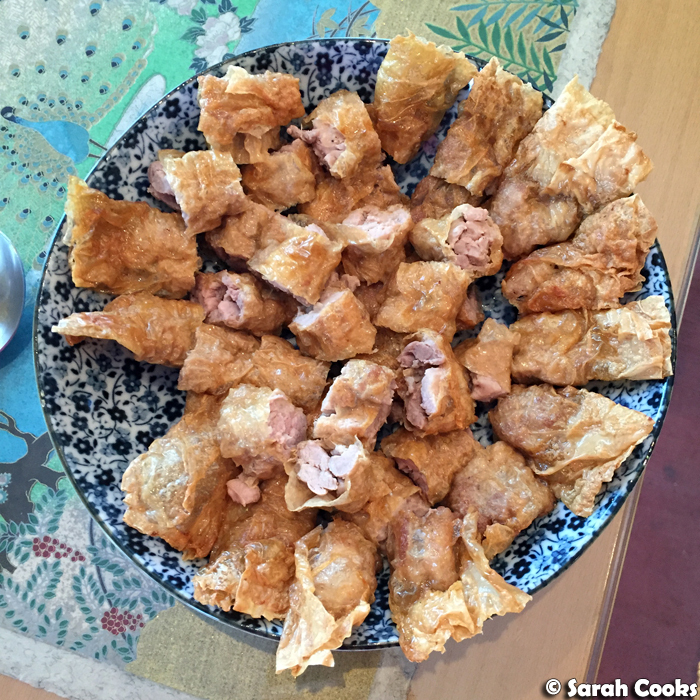 My mum's loh bak is the best - just chunky chopped pieces of belly pork, mixed with some 5-spice, wrapped in bean curd skin and deep fried. The corner pieces are the best! She serves it with sliced cucumber and a mild chilli sauce. 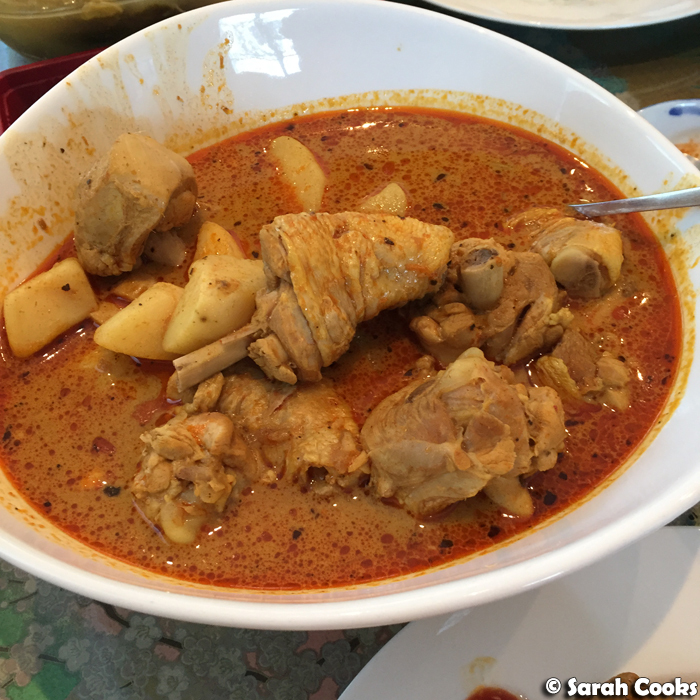 My dad made the chicken curry kapitan this year - apparently he was up late the night before, worried that the gravy would be too thin and watery, but as you can see, it was perfect. Sedap, man! Kiam chye th'ng (made by my dad!) doesn't look attractive, but is soooo good! 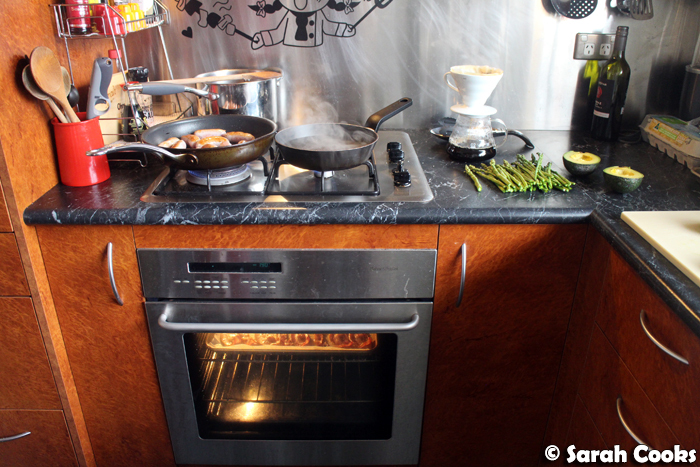 Inside, you've got duck maryland and (I think) pork trotters, as well as Chinese mushrooms, tomato and mustard greens. It's really nourishing and delicious. 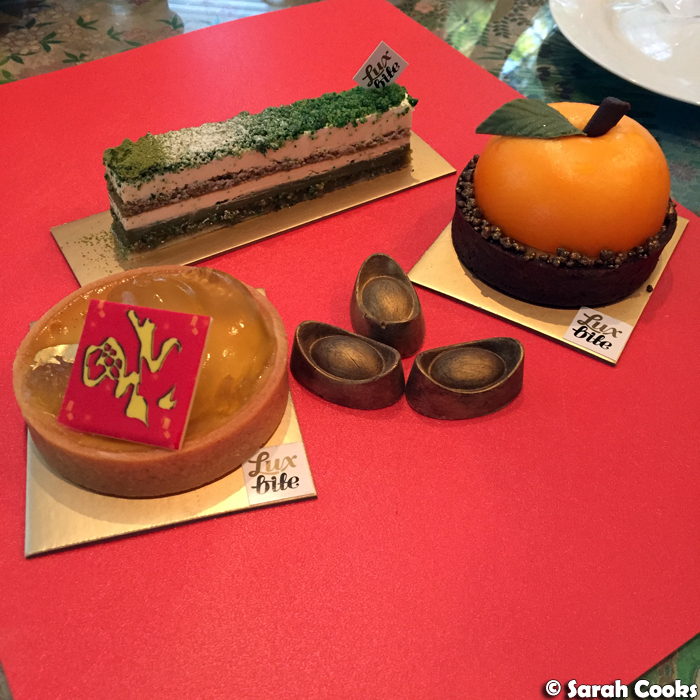 Sandra and I brought dessert - I'd seen LuxBite's Chinese New Year range on their Instagram, and just knew they'd be great! (N.B. the green tea cheesecake wasn't a Chinese New Year special, but I couldn't resist when we saw it at the store that morning). These were all excellent. I'll say what I always say when I have a LuxBite tart or cake - the flavours are always really well balanced, they're not overly sweet or rich, and the textures are awesome! (That coconut mousse in the Prosperity tart - wow). My parents loved the cakes, and were impressed that these enterprising Malaysian kids had created such a successful business. (Malaysians represent, amirite!) 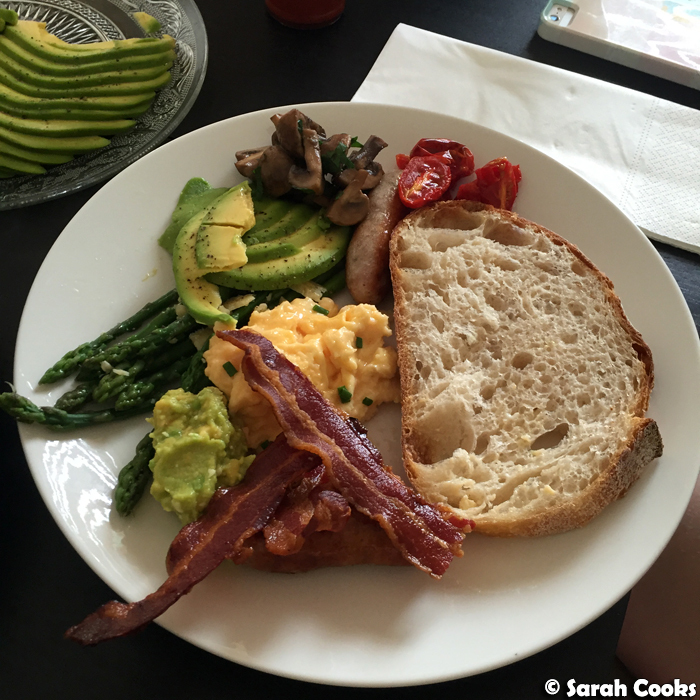 We are totes coming in for brunch as soon as possible! There were, um, more sweets on the big day itself. This year, Chinese New Year fell on a Monday, so it was a regular work day. However, I had bought myself a new red dress (it's good luck to wear new clothes!) and wore my lucky Jubly-Umph pineapple earrings to get into the spirit! I organised to have breakfast with my buddy Jimbo at Short Stop. They were doing a Chinese New Year flavour, with pork floss and black sesame! (N.B. this flavour was only available over the weekend before CNY and the day itself). 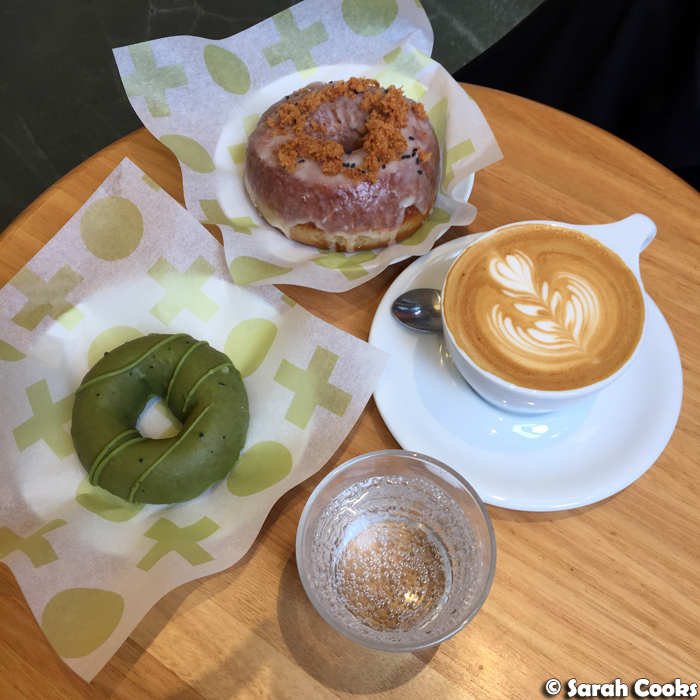 We got a pork floss and a matcha donut. 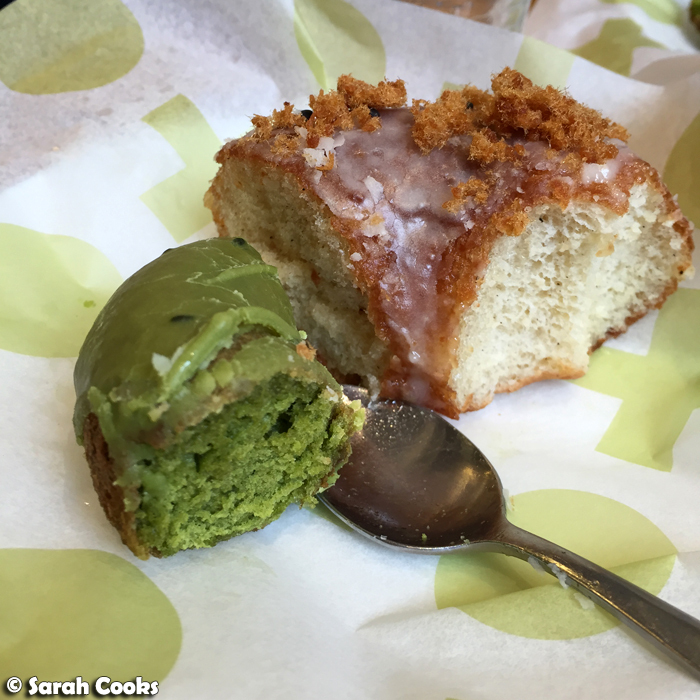 Short Stop started doing matcha donuts about a week ago, and I was so excited to try one! It was a triple-matcha donut, with a matcha cake donut base, white chocolate & matcha glaze, finished with matcha icing stripes. It was a little dry, but otherwise very nice, with a good prominent matcha flavour. (Side note: matcha is Japanese, and Japan doesn't celebrate lunar new year - they switched over to the Gregorian calendar back in 1872. So there you go). Apparently the matcha donuts have been super popular, and are on for all of February - woohoo! I was less excited at the prospect of the pork floss flavour, but I'm so glad we tried it - because it was delicious! If you haven't had pork floss before, it's a salty-sweet dried pork mixture that kinda looks and feels like fairy floss. I used to eat it on white bread with margarine when I was little. Anyhoo, the pork floss donut was great! It was a super light and fluffy raised donut, with a sweet sugar glaze and a savoury note from the black sesame and pork floss. It was a bit of a mind trip, and so tasty. There was more indulgence at lunch! 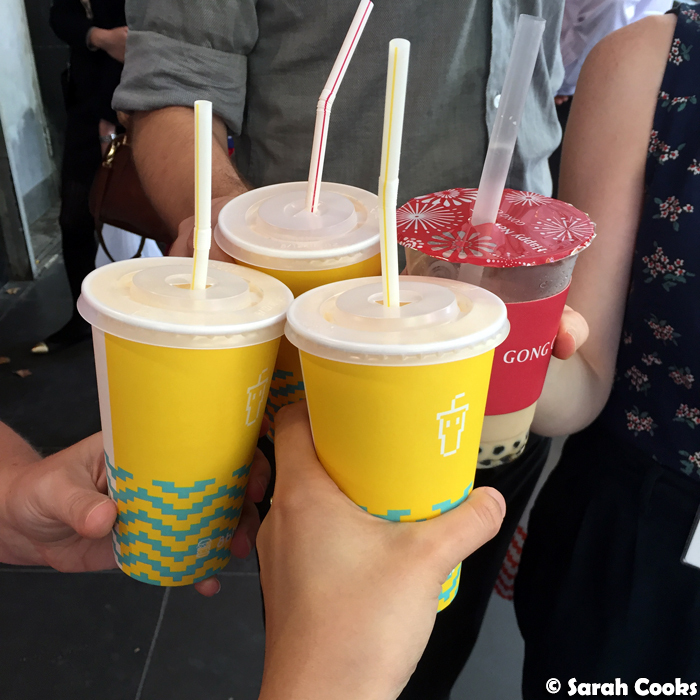 My friend Alaina and I have a CNY tradition of eating Hot Star Chicken and Gong Cha bubble tea, and this year we upgraded the experience by inviting Jimbo and his girlfriend Jenni along, and making it a combined Hot Star / Gong Cha / 8-Bit lunch! The three stores are located right next to each other at the corner of Little Bourke and Swanston streets - it's a Chinese New Year miracle! 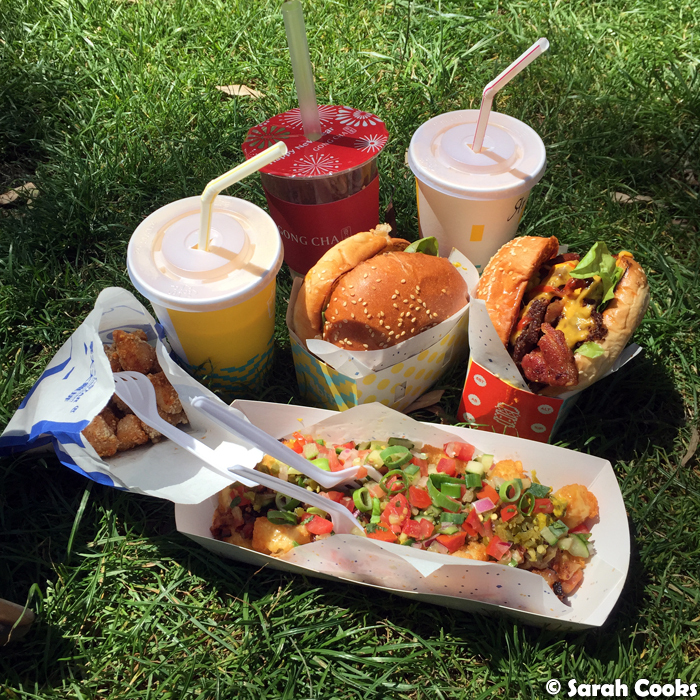 We bought a selection of things from both stores, and took them up to the State Library lawn to eat. Alaina got little chicken bites from Hot Star. Super tasty and much easier to eat than the original large Hot Star fried chicken. From 8-Bit, Jenni and Jimbo each got burgers (the 1-Up Mushroom burger for her, the Double Dragon with double beef, double bacon, double cheese for him), and I got fully loaded potato gems! The potato gems were topped with chilli beef, cheese sauce, bacon, pickle relish, grilled onions and jalapeños. I figured that potato gems kinda look like little gold bars, and "fully loaded" totally symbolises wealth and abundance for the new year. (And other excuses....) The potato gems got a little soggy under all that topping, but the flavours were really good. Finally, I wanted to show you a pic of some kuih bangkit that I gave to Alaina as a CNY present. These were bought at an Asian grocer (no, I didn't bake them), and are a traditional sweet that Chinese Malaysian people eat during the festive period. 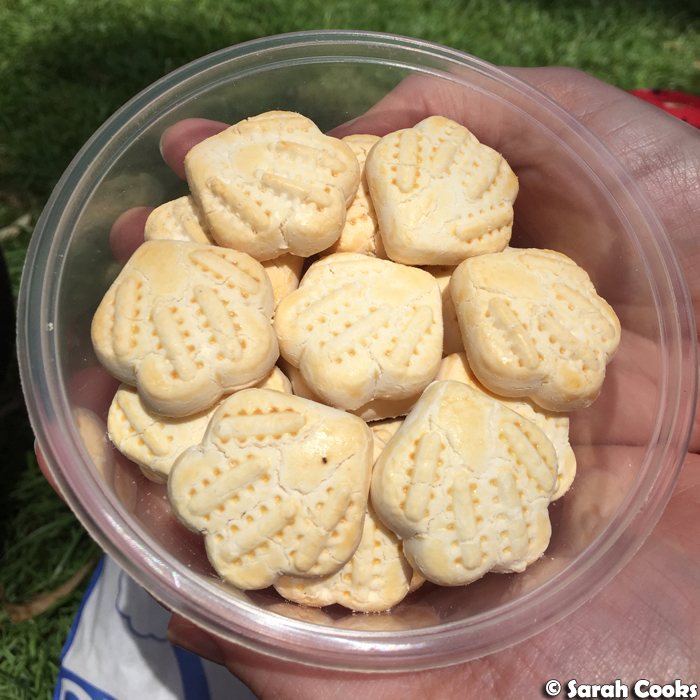 They're little cookies made of tapioca - they're super crumbly and just melt in your mouth. I love these! 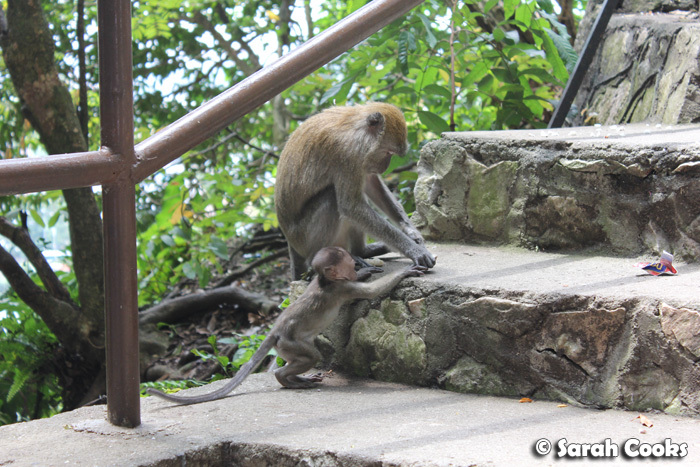 Speaking of happy things, I'll finish this post with this super cute picture of a baby monkey and its parent. Naaaaaw! All the best for an awesome and prosperous year of the monkey!